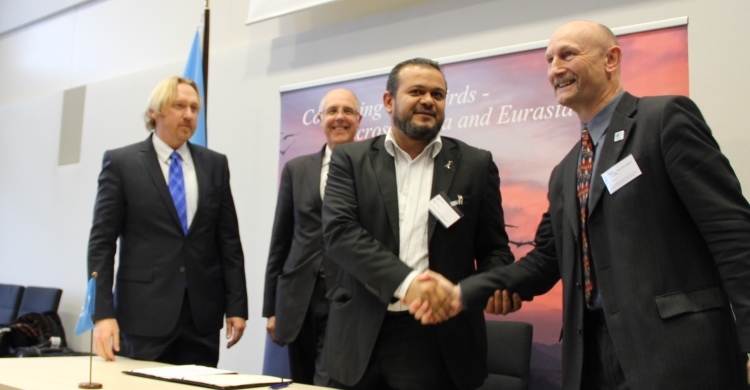 Libya Becomes 46th Signatory to the Raptors MOU. Photograph courtesy of Francisco Rilla, UNEP/CMS. Bonn, 29 November 2013 – Libya signed the CMS Memorandum of Understanding on the Conservation of Migratory Birds of Prey in Africa and Eurasia (Raptors MOU) at a ceremony organized during a Coordination Meeting on Bird Netting in Egypt in Libya held in Bonn, Germany. Mr. Essam Mohamed Bouras, Head of Protected Area Section at the Environment General Authority, signed the Raptors MOU on behalf of the Libyan Government. In a short statement, he asserted Libya’s commitment to conserve migratory birds of prey as these species are a key component of the country’s rich biodiversity. Libya is situated on an important migratory route for African-Eurasian birds of prey, and offers particularly important staging areas and stop-over habitats for migrants that cross the Mediterranean Sea in spring and autumn each year. Twenty-six of the migratory birds of prey species listed on the Raptors MOU occur in Libya. Five of these, the Egyptian Vulture (Neophron percnopterus), the Saker Falcon (Falco cherrug), the Sooty Falcon (Falco concolor), the Red-footed Falcon (Falco vespertinus) and the Pallid Harrier (Circus macrourus) are globally threatened, based on IUCN criteria. Currently, there are some major knowledge gaps about the status and routes used by migratory birds of prey in Libya. Sooty Falcons are believed to breed in parts of the Libyan Desert but this assessment is based on information gathered more than 50 years ago. Libya’s signature of the Raptors MOU represents a new and important opportunity to gather up-to-date knowledge and information to fill the gaps, including in collaboration with other Signatories. It should also assist in developing plans and implementing actions to address some of the many threats facing birds of prey in the modern world. Libya is the 46th Signatory to the Raptors MOU. The instrument will become effective in the country on 1 December 2013. Raptors MoU Secures 50 Signatories!